A WELL-FED monster of a crocodile snaps to life, startled from its nap. It stampedes through the crunchy undergrowth, crashing into the water, becoming invisible except for a pair of sentry-post eyes that peek menacingly above the surface to monitor outside movements. As if nothing has happened, a huge bull elephant, grazes on the shoreline vegetation, its body half-submerged in water, chewing and munching. The shoreline vegetation is juxtaposed with a cloak of virgin forest, where dappled bushbuck move in fleet yet silent through the thicket. Shaggy water buck, buffalo and other grazers invade the shoreline for a sip of the life-saving water, forever, stalked by predators. 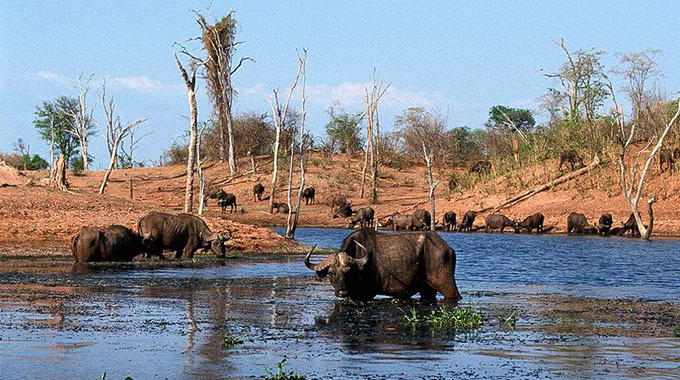 Welcome to Matusadonha National Park situated on the south-eastern shores of Lake Kariba in Zimbabwe. This is by far the remotest part of Zimbabwe and has by and large remained undeveloped and virgin. It is not a place for the fainted hearted but for the most discerning tourist. The park lacks infrastructure as well as marketing and is therefore not a place to visit by the weak and those who do not have 4×4 vehicle. Matusadonha National Park is situated on the shores of Lake Kariba but was proclaimed a non-hunting area on November 7 1958 before the dam was built. It became a Game Reserve in 1963, and in 1975, in terms of the Parks and Wildlife Act, it became a national park. The park comprises some 1 400 square kilometres of diverse flora and fauna. Before the lake was built, Matusadonha was a vast, rugged wilderness with limited access. With the lake came ecological changes. One in particular, the lake-shore contributed greatly to the increase of large mammal populations in the area, especially elephant and buffalo. The grass found on the shoreline is Panicum ripens and is a rejuvenating grass – needing only fluctuating lake levels to replenish its nutrients. 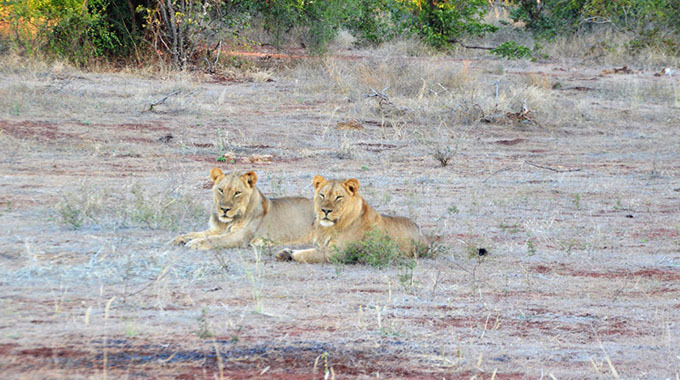 With this ready food source, buffalo, waterbuck, zebra, and even impala have thrived and with them the predators. Matusadonha is an Intensive Protection Zone (IPZ) and home to several relocated rhinoceros. The southern boundary of the park is the Omay communal land and the northern boundary is the lakeshore. The eastern side of Sanyati Gorge and the middle of the Ume River provide the east and west boundaries respectively. Matusadonha has three distinct ecological areas. First is the lake and shoreline grassland; second, the Zambezi Valley floor, a mass of thick jesse and mopane woodland, and; third, the escarpment area of Julbernadia and Brachystegia woodlands. The Jesse/Mopani area is sparsely grassed, but provides habitat for browsers, most notably the black rhino. Elephants range throughout the park, seeking the shade of the Jesse in the heat of the day. The Zambezi Escarpment rises some 700 metres above the valley floor and is extremely rugged. Over the years, elephant and fire depredations have caused the once substantial woodlands to dwindle, and in parts, grasslands have taken over. It became necessary to take control measures to reduce the elephant population to a manageable size. There is need for serious investment to bring the park to touristic life. There is need to do sustainable conservation work, which the Government of Zimbabwe will not be able to do alone. Serious investors are needed for sustainable tourism. Animal species that are found in abundance include elephant and buffalo. Other common species are those of: night ape, honey badger, civet, small spotted genet, slender mongoose, banded mongoose, spotted hyaena, wild cat, lion, leopard, yellow spotted dassie, black rhinoceros, zebra, warthog, common duiker, grysbok, klipspringer, waterbuck, bushbuck, scrub hare, porcupine, vervet monkey, chacma baboon, side-striped jackal, hippopotamus, roan antelope, kudu and bush squirrel. Some of the more elusive species include: clawless otter, white-tailed mongoose, reedbuck, sable antelope, eland, civet, rusty spotted genet, caracal and bush pig. Animals that are present but only sighted on rare occasions include wild dog, cheetah, roan and pangolin. The park has a camping site at Tashinga on the lake shore. There is an ablution block with hot and cold water, showers, toilets, wash basins and baths. Firewood and braai facilities are available. Some of the camping sites have sleeping shelters. There is a smaller camping site at Sanyati consisting of six sites, each with a braai stand. There is an ablution block with hot and cold water and laundry trough. Changachirere Camping Site is an exclusive camping site that caters for one party of a maximum of 10 persons. The facility has a mini-ablution block and shelter. There are also two totally undeveloped bush camping sites at Jenje and Kanjedza for up to a maximum of 10 persons per camp. Visitors must be fully equipped and have a four-wheel-drive vehicle for this section. It is situated close to Tashinga Airstrip on the east bank of the Bumi River, 55 kilometres from Kariba by boat. Situated at Elephant Point, 44 kilometres from Kariba by boat. Also situated on the Bumi River upstream around 300 metres beyond Ume Camp. Other exclusive camp sites can be found at Maronga close to the Chifudzi substation and Kautsiga sited on the escarpment, which is ideal for hikers and climbers. The closest convenience shops are found in Kariba town, therefore, visitors are advised to thoroughly pack for the trip. Petrol, diesel and oil are sometimes available at Bumi Harbour but supplies are not always reliable. The road to Matusadonha from Magunje Growth Point in Karoi serpents through communal Zvipane, giving way to a dirty road to Msampakaruma before giving way to Matusadonga National Park. The road to the park is strictly a four by four affair but the experience is excellent.